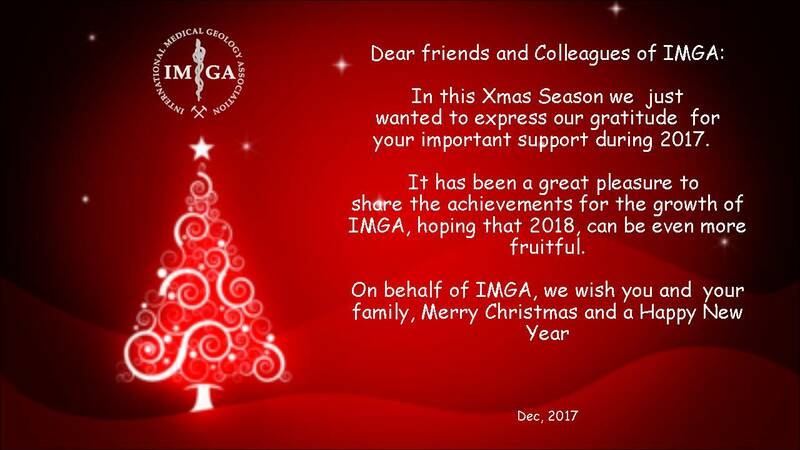 Merry Christmas to all IMGA members and their famalies!!! Congratulations to Tatiana Cocerva on winning the best oral presentation award at MedGeo'17, the 7th conference of the International Medical Geology Association in Moscow. Tatiana wrote about her experience at the conference in a very nice blog post. For the curious ones please visit the blog or download the pdf version. Thank you Tatiana for sharing your view. The October IMGA e-news can now be downloaded from the member site. GeoHealth-2017 is organized by the International Society for Photogrammetry and Remote Sensing (ISPRS) Inter-Commission Working Group on Environment and Health (ICWG III/IVc), in collaboration with ISPRS WG on Open Source on Geospatial Technology (WG V/8) and hosted by the Administrative Staff College of India (ASCI), and supported by ICORG. The deadline for applications for MEDGEO 2017 student travel awards is May 31, 2017. Download the application from the member website. 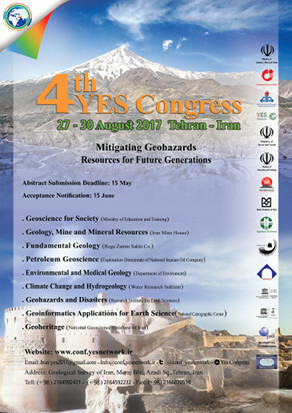 On the 10th anniversary of the YES network, the Geological Survey of Iran will host the 4th YES Congress in Iran entitled Mitigating Geohazards, Resources for Generations. Tehran will host one of the most significant events in the field of earth science with the presence of young professionals from around the world. This congress consists of 9 themes in cooperation with various departments and organizations: Ministry of industry, Mine and Trade, Ministry of Sports and Youth, Ministry of Education and Training, Department of Environment, Exploration Directorate of National Iranian Oil Company, Iranian Mining Engineering Organization, Iran Mine House, IMPASCO Company, and Water Research Institute. This event includes some side programs such as workshops, field trips, exhibitions, and competitions to elect the top geologist of 2017, top photo, and top article. Iran and China will have a joint meeting one day before the opening ceremony. Webinar instructions went out via e-mail yesterday evening. If you are a current IMGA member and did not receive an e-mail titled "Online Webinar Invitation - Drinking water quality and health studies – examples and possibilities in Denmark," please contact María Aurora Armienta. Drinking water quality can affect our health both positively and negatively because of our long-term, constant exposure to it. In Denmark, drinking water originates from groundwater and its quality is mainly defined by human inputs (such as nitrate) and geological inputs depending on local geochemistry. Drinking water infrastructure in Denmark is highly decentralized with around 2,700 waterworks supplying the population of around 5.7 million. Drinking water quality has been registered in a national geodatabase for many decades. Next to registration of drinking water quality, health-related data of the whole Danish population on an individual-level is available. This allows us to connect drinking water quality exposure to a variety of health outcomes. In this webinar you will learn about our approach to link drinking water quality data and health outcomes. You will hear about the challenges that we encountered and see some of the preliminary results of our ongoing work with focus on nitrate in drinking water and colorectal cancer. Short CV: Jörg Schullehner is an Environmental Engineer from ETH Zurich and the Technical University of Denmark. He obtained a PhD in Medicine for his work on drinking water quality and health outcomes with a focus on nitrate and its association to colorectal cancer. This work is the base for a number of new projects looking at drinking water quality and health, exploiting the Danish registers on drinking water quality, civil registration and health. He is currently working as a Postdoc at the National Centre for Register-based Research at Aarhus University and the Geological Survey of Denmark and Greenland. Medical Geology Newsletter 28 is now available in the member section. The new issue of the U.S. Geological Survey's Environmental Health Newsletter is now available online at https://www2.usgs.gov/envirohealth/geohealth/v14_n01.html. It's official! IMGA is now a registered association of Portugal (PDF). That means a new Constitution and Bylaws approved by the registration authority in Portugal. Click on the IMGA link above to view it.